A tuple is a sequence of values. The values can be any type, and they are indexed by integers, so in that respect tuples are a lot like lists. The important difference is that tuples are immutable. Because tuple is the name of a built-in function, you should avoid using it as a variable name. And the slice operator selects a range of elements. The left side is a tuple of variables; the right side is a tuple of expressions. Each value is assigned to its respective variable. All the expressions on the right side are evaluated before any of the assignments. The return value from split is a list with two elements; the first element is assigned to uname, the second to domain. Strictly speaking, a function can only return one value, but if the value is a tuple, the effect is the same as returning multiple values. For example, if you want to divide two integers and compute the quotient and remainder, it is inefficient to compute x/y and then x%y. It is better to compute them both at the same time. max and min are built-in functions that find the largest and smallest elements of a sequence. min_max computes both and returns a tuple of two values. Write a function called sumall that takes any number of arguments and returns their sum. zip is a built-in function that takes two or more sequences and “zips” them into a list1 of tuples where each tuple contains one element from each sequence. The result is a list of tuples where each tuple contains a character from the string and the corresponding element from the list. If the sequences are not the same length, the result has the length of the shorter one. Dictionaries have a method called items that returns a list of tuples, where each tuple is a key-value pair2. As you should expect from a dictionary, the items are in no particular order. The dictionary method update also takes a list of tuples and adds them, as key-value pairs, to an existing dictionary. The expression in brackets is a tuple. We could use tuple assignment to traverse this dictionary. This loop traverses the keys in directory, which are tuples. It assigns the elements of each tuple to last and first, then prints the name and corresponding telephone number. 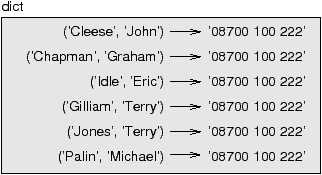 Here the tuples are shown using Python syntax as a graphical shorthand. The telephone number in the diagram is the complaints line for the BBC, so please don’t call it. The relational operators work with tuples and other sequences; Python starts by comparing the first element from each sequence. If they are equal, it goes on to the next elements, and so on, until it finds elements that differ. Subsequent elements are not considered (even if they are really big). The sort function works the same way. It sorts primarily by first element, but in the case of a tie, it sorts by second element, and so on. by extracting the sorted elements of the sequence. The first loop builds a list of tuples, where each tuple is a word preceded by its length. sort compares the first element, length, first, and only considers the second element to break ties. The keyword argument reverse=True tells sort to go in decreasing order. The second loop traverses the list of tuples and builds a list of words in descending order of length. Exercise 2 In this example, ties are broken by comparing words, so words with the same length appear in reverse alphabetical order. For other applications you might want to break ties at random. Modify this example so that words with the same length appear in random order. Hint: see the random function in the random module. I have focused on lists of tuples, but almost all of the examples in this chapter also work with lists of lists, tuples of tuples, and tuples of lists. To avoid enumerating the possible combinations, it is sometimes easier to talk about sequences of sequences. In many contexts, the different kinds of sequences (strings, lists and tuples) can be used interchangeably. So how and why do you choose one over the others? To start with the obvious, strings are more limited than other sequences because the elements have to be characters. They are also immutable. If you need the ability to change the characters in a string (as opposed to creating a new string), you might want to use a list of characters instead. In some contexts, like a return statement, it is syntactically simpler to create a tuple than a list. In other contexts, you might prefer a list. If you want to use a sequence as a dictionary key, you have to use an immutable type like a tuple or string. If you are passing a sequence as an argument to a function, using tuples reduces the potential for unexpected behavior due to aliasing. Because tuples are immutable, they don’t provide methods like sort and reverse, which modify existing lists. But Python provides the built-in functions sorted and reversed, which take any sequence as a parameter and return a new list with the same elements in a different order. Lists, dictionaries and tuples are known generically as data structures; in this chapter we are starting to see compound data structures, like lists of tuples, and dictionaries that contain tuples as keys and lists as values. Compound data structures are useful, but they are prone to what I call shape errors; that is, errors caused when a data structure has the wrong type, size or composition. For example, if you are expecting a list with one integer and I give you a plain old integer (not in a list), it won’t work. And here’s a dictionary with 3 items that map integers to strings. If you are having trouble keeping track of your data structures, structshape can help. An immutable sequence of elements. An assignment with a sequence on the right side and a tuple of variables on the left. The right side is evaluated and then its elements are assigned to the variables on the left. The operation of assembling a variable-length argument tuple. The operation of treating a sequence as a list of arguments. Abbreviation of “decorate-sort-undecorate,” a pattern that involves building a list of tuples, sorting, and extracting part of the result. A collection of related values, often organized in lists, dictionaries, tuples, etc. A summary of the type, size and composition of a data structure. Exercise 3 Write a function called most_frequent that takes a string and prints the letters in decreasing order of frequency. Find text samples from several different languages and see how letter frequency varies between languages. Compare your results with the tables at wikipedia.org/wiki/Letter_frequencies. Write a program that reads a word list from a file (see Section 9.1) and prints all the sets of words that are anagrams. Hint: you might want to build a dictionary that maps from a set of letters to a list of words that can be spelled with those letters. The question is, how can you represent the set of letters in a way that can be used as a key? Modify the previous program so that it prints the largest set of anagrams first, followed by the second largest set, and so on. In Scrabble a “bingo” is when you play all seven tiles in your rack, along with a letter on the board, to form an eight-letter word. What set of 8 letters forms the most possible bingos? Hint: there are seven. Two words form a “metathesis pair” if you can transform one into the other by swapping two letters3; for example, “converse” and “conserve.” Write a program that finds all of the metathesis pairs in the dictionary. Hint: don’t test all pairs of words, and don’t test all possible swaps. You can download a solution from thinkpython.com/code/anagram_sets.py. What is the longest English word, that remains a valid English word, as you remove its letters one at a time? Now, letters can be removed from either end, or the middle, but you can’t rearrange any of the letters. Every time you drop a letter, you wind up with another English word. If you do that, you’re eventually going to wind up with one letter and that too is going to be an English word—one that’s found in the dictionary. I want to know what’s the longest word and how many letters does it have? I’m going to give you a little modest example: Sprite. Ok? You start off with sprite, you take a letter off, one from the interior of the word, take the r away, and we’re left with the word spite, then we take the e off the end, we’re left with spit, we take the s off, we’re left with pit, it, and I. Write a program to find all words that can be reduced in this way, and then find the longest one. You might want to write a function that takes a word and computes a list of all the words that can be formed by removing one letter. These are the “children” of the word. Recursively, a word is reducible if any of its children are reducible. As a base case, you can consider the empty string reducible. The wordlist I provided, words.txt, doesn’t contain single letter words. So you might want to add “I”, “a”, and the empty string. To improve the performance of your program, you might want to memoize the words that are known to be reducible. You can see my solution at thinkpython.com/code/reducible.py. In Python 3.0, zip returns an iterator of tuples, but for most purposes, an iterator behaves like a list. This behavior is slightly different in Python 3.0. This exercise is inspired by an example at puzzlers.org.